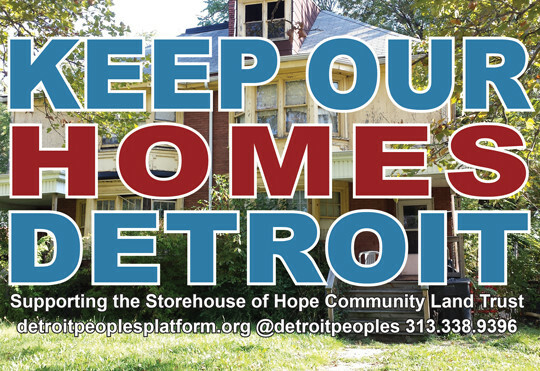 Detroit People’s Platform and Storehouse of Hope Community Land Trust are teaming up to purchase occupied homes in the auction and secure them permanently in a Community Land Trust (CLT) so families can stay in their homes and we can ensure that these properties remain permanently the off marketplace and out of the hands of speculators. Families participating in the program have been connected through the United Community Housing Coalition. UCHC provides free housing resources for low and no-income Detroiters. We’ve reached a vital moment where we can beat the auction at its own game and buy land to 1) keep families housed and 2) place more homes in a community land trust that will ensure these homes remain permanently affordable and safe from speculation. How It Works: The money we raise will be used to keep Detroit families in their homes. Many occupied homes were purchased last year for as little as $1,700—you can see how much impact each dollar you donate will have. All additional funds raised beyond the cost of purchase will go into repairs to the home and paying 2015 taxes. We have the the opportunity to keep Detroit families in their houses. But we only have 10 days to do it.